Dark green spots on leaves. Bulbous lower stem, near the roots. 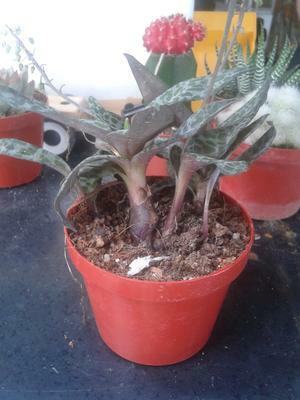 It is a small plant. White layer on surface of leaves gives an impression of green spots. Dark green and a mixture of purple on lower leaves. Bulbous lower stem. A stalk coming out of the middle with tiny green flowers on it. 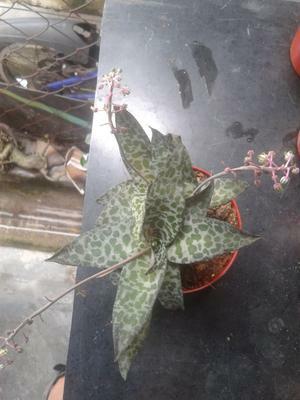 Hi Alex, this seems to be a type of Ledebouria socialis, which is also called Leopard Squill, due to the spots on the leaves. Yours seems to have wider leaves than the one I have (and can't kill - they are cast iron!) but I'm pretty sure it's either a very close relative or just grows differently in your conditions. The bulb part, which is just part of the stem, will eventually split to form several plants in a little clump, and they're easy to split apart and give away to friends. This little charmer makes a great ground cover in a warm area too, so if you're where there is never a risk of frost, that's another way to grow it - or use it the same way for a large planter. That's the closest I can come to an identity on this one, so maybe someone else will recognize it. I know there are a couple of other similar plants.